Novak Djokovic is an unstoppable professional tennis player from Serbia, in 2008 he won his 1st multiple Grand Slam championships and continued in 2011 to take over the number one ranking, currently ranked by the Association of Tennis Professionals as the world number one men’s singles player. Born on May 22, 1987 in Belgrade Serbia, his parents owned a company called Family Sports that consisted of a tennis academy and three restaurants. His uncle and aunt were professional skiers and his father an excelled soccer player. Tennis legend Jelena Gencic spotted Djokovic in 1993 and although he was only 6 years old, Gencic worked with him for the next six years. Due to the war in Yugoslavia and bombings of Belgrade the young tennis player and his family was forced to spend hours in the basement, and Djokovic said the hardships of war is what drove him to pursue tennis with greater determination. At 13 he went to Pilic Academy in Munich, Germany to pursue higher levels of competition and in 2001, aged 14 he started his international career. Novak Djokovic’s commercial success started all after he finished 2001 as the triple European champion in doubles, singles and team events. In the World Junior Championship team competition he won a silver medal and at age 16 he was ranked the 40th best junior tennis player in the world, after winning five ITF tournaments. His admirable run of success continued and in 2004 he won his first ATP Challenger tournament in Budapest. Only a year later he qualified at Wimbledon where he reached the third round, moving him up into the Top 100 rankings. Three years in a row Djokovic won the men’s singles at the Tennis Australian Open and became the runner-up at Wimbledon in 2013 by losing the final to Andy Murray. He was the top ranked player at the U.S. Open where he easily dispatched his opponent in the first three rounds and in the final he lost to Rafael Nadal. Novak continued to claim his second Wimbledon title in 2014 in an epic five set win over Roger Federer, a seven-time champion. He defeated Andy Murray at the 2014 U.S. Open, reached the semifinals for the eight time, and was defeated by Kei Nishikori from Japan in the Grand Slam final. 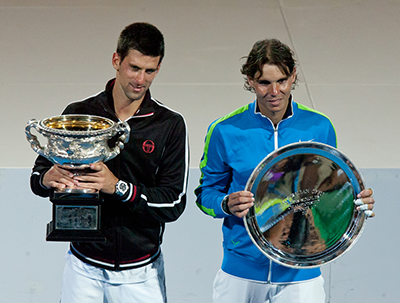 After a heated battle, Djokovic defeated Andy Murray and won the Tennis Australian Open in 2015 to claim his fifth Australian Open title and also his eight Grand Slam title. In the quarter finals of the French Open he knocked off Rafael Nadal, the nine-time champion, but failed to claim his French crown when he lost to Stan Wawrinka in the final. In July of 2015 Djokovic defeated Richard Gasquet in the semi-finals at Wimbledon, but he was to face Federer in a rain delayed match at the U.S Open in the final. Here he clinched a tough four set win, this victory awarded him his tenth major singles title and left Djokovic with a remarkable 27-1 record in Grand Slam play for the year. 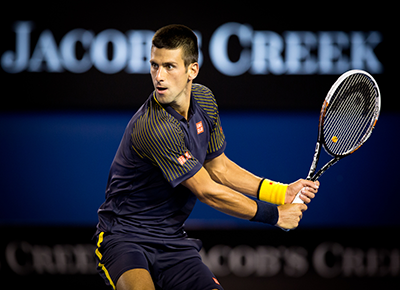 Novak Djokovic’s impressive career as a professional tennis player comprises of several remarkable records and milestones. In significant Grand Slam tournament finals he won eight titles and was eight times a runner-up, in Olympic medal matches he won a bronze medal and won 5 finals at Year-End Championships. In ATP Masters 1000 finals he won 26 single titles and was the runner up in 12 finals. His ATP career finals include 59 single titles and he was the runner up in 26 matches and also won the doubles title. Winning streaks include 43 in 2010 to 2011, 38 indoor winning streaks in 2012 to 2015 and 28 winning streaks in China in 2012 to 2014. He became the first Serbian player to win the Grand Slam singles title when he defeated Jo-Wilfried Tsonga in four sets in the Tennis Australian Open final. Djokovic broke the record for the most ATP Master 1000 titles in one season. In 2012 he won his third Tennis Australian Open in a game that was the longest match in the history of the Australian Open, by defeating Nadal. Novak Djokovic is the first player to win the World Tour Finals for four consecutive years and the only player to win his first 5 finals at the tour finals. He also broke the record by winning 6 Masters 1000 titles in 2015. He was rated second after racking up the most wins in the Open Era over other top 10 ranked players, and he set a season single record of 31 wins in 2015. His endorsements include, being the brand ambassador for Audemars Peugeot, Bombardier Aerospace, a Swiss watch manufacturer, Mercedes Benz and has a partnership with CAA Sports. Novak Djokovic speaks Serbian, German, English and Italian fluently. Launched in 2007, the Novak Djokovic Foundation provides financial support to disadvantaged children in Serbia and has a net worth of around $90 million. Known for his sportsman’s spirit and graceful attitude, Djokovic also has a playful side and loves impersonating Federer, Nadal & Sharapova and he has some strange habits, which include eating grass whenever he is at Wimbledon and says it tastes like sweets, plus he also talks to himself while playing. Being an animal lover he takes Pierre, his white poodle with wherever he goes. While the Serbian Blues rock band Zone B dedicated their song “The Joker” to Novak, he has featured in the music video of the song “Hello” by Martin Solveig plus he was voted the 19th most influential man on Askmen.com in 2011. His book “Serve to Win” includes 14 day gluten-free diet plans for improved fitness and recounts his journey of becoming one of the greatest tennis players of all times. Novak Djokovic says that the most common word to him is “Belief” for one to achieve, he needs to truly believe in his dreams.